Measuring progress in the local scene isn’t easy – there are just so many external factors that take shape to elevate a band to that higher level of appeal. It’s usually a combination of tenacity, attention to detail, potent live performances, and most of all that essence of going with your strengths to release killer products. 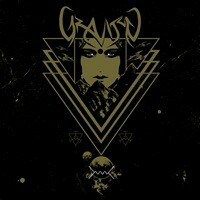 In the case of northcentral Massachusetts thrash band Graviton, they released a potent debut EP in 2016 with Fundamental Violence, gaining the opportunity to do a few self-financed tours across portions of the US, while also opening for national/international acts locally. 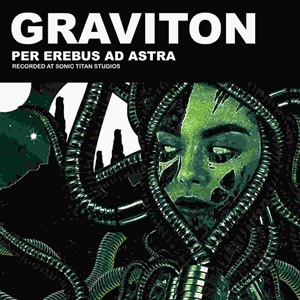 Two and a half years later, the debut full-length Per Erebus Ad Astra has finally arrived – and after numerous spins, this material puts the quartet into the ranks of bands that will make fans and musicians alike sit up, take notice, and champion the aggression, the musicianship, and the finesse necessary to be brutal and memorable all at the same time. It’s easily identifiable that the band garner a meaner outlook – the riffing often as relentless and developing a blackened/extreme edge, while the cleaner transitions take on a progressive, often dissonant sheen, while drummer Anthony Medaglia pummels his kit at feverish pacing, often over 250 BPM’s during much of the double shot explosiveness that is “My Degeneration” and “Signals from Beyond”. Guitarist Cameron Tidman unfurls sick speed licks and tight on a dime transitions, but can also settle into a mid-tempo chug from time to time, most evident on the main hooks for “The Alchemist” that takes things into Arch Enemy meets Goatwhore on a Bay Area trip territory. All of this speed would be for naught if Graviton didn’t produce dynamic curveballs as well, which is what you’ll get in “Tomes of the Mystic” – a doomy affair that contains a bit of “Be All, End All” / Anthrax for the opening strains before moving into something that conjures up the bowels of hell from Taylor Scott’s forceful vocal bellow, perfect against the groovy, churning riff cauldron. The lyric content has a connection almost in a story-theme format without being full on conceptual – the brief synopsis of the title translating to “Through Darkness, To the Stars” and dealing with the darkness of a worsening society, Armageddon, and eventually humanity escaping Earth to reach the stars and survive in another world. Intertwining reality, sci-fi, and mythology, it’s heady stuff to go against the propulsive music on display. Favorites change daily – the late 80’s/early 90’s Sepultura feel to “Shattered Repose” and militant, spacey/cyber-ish feel to the closing 6:37 epic “NGC 1277 Part II” currently firing off the synapses on all fronts, but there isn’t a bad note out of the ten tracks (which includes two shorter interludes “Per Erebus” and “Ad Astra”). Anthony also used his production skills at Sonic Titan Studios along with Joel Grind of Toxic Holocaust for mastering duties to give the record that robust, sonic longevity. If names like Sepultura, Goatwhore, Skeletonwitch, Kreator, Anthrax, and primal thrash means anything to you, Graviton needs to be a part of your collection. As they hit a home run for Per Erebus Ad Astra, one that may be hard to top for blackened, progressive thrash in a long, long time.